(a) As of the First Expansion Date, the Premises shall be expanded to include the First Additional Premises. Landlord shall deliver the First Additional Premises to Tenant on the First Expansion Date in the Delivery Condition. From the First Expansion Date until the Second Expansion Delivery Date, the Premises shall consist of the Original Premises and the First Additional Premises. (b) Landlord shall not (i) expand the rights of Existing Other Tenant to use Landlord's Property beyond those that exist under its lease as of the Effective Date or (ii) give Existing Other Tenant the right to use or occupy any portion of the Second Additional Premises beyond _________. As used herein, the "Second Expansion Delivery Date" means (aa) __________, if Existing Other Tenant is not then in occupancy of any portion of the Second Additional Premises and Landlord has then put the Second Additional Premises in the Delivery Condition, or (bb) if, as of ___________, Existing Other Tenant is in occupancy of all or any portion of the Second Additional Premises or Landlord has not put the Second Additional Premises in the Delivery Condition, such later date as of which Existing Other Tenant has vacated and surrendered the Second Additional Premises and Landlord has put the Second Additional Premises in the Delivery Condition, but not later than thirty (30) days after Existing Other Tenant vacates and surrenders the Second Additional Premises. If Existing Other Tenant holds over in any portion of the Second Additional Premises beyond _________, Landlord will not have any liability to Tenant for the delay in the Second Expansion Delivery Date caused by such holdover, but Landlord shall take commercially reasonable steps to recover possession of the Second Additional Premises from Existing Other Tenant and to put the Second Additional Premises in the Delivery Condition. Landlord shall attempt in good faith to keep Tenant informed as to the anticipated Second Expansion Delivery Date, and shall respond to Tenant's inquiries in connection therewith. As of the Second Expansion Delivery Date, the Premises shall be expanded to include the Second Additional Premises. Landlord shall deliver the Second Additional Premises to Tenant on the Second Expansion Delivery Date in the Delivery Condition. From and after the Second Expansion Delivery Date, the Premises shall consist of the entire Building and Tenant shall have the exclusive right to possess the entire Landlord's Property (subject to Landlord's rights of access as provided herein). Notwithstanding the above provisions of this Section 2.1(b) to the contrary, Tenant's rent obligations with respect to the Second Additional Premises shall not commence until the Second Expansion Rent Commencement Date. (c) The First Additional Premises are presently unleased. Landlord will not lease the First Additional Premises to a third party, other than under a lease that would commence after the Lease Term. From the Commencement Date until the First Expansion Date, Tenant shall have the right to use the First Additional Premises for dead storage purposes and to make improvements to and otherwise prepare for occupancy of the First Additional Premises, without the obligation to pay Base Rent therefor. Such use of the First Additional Premises prior to the First Expansion Date shall be subject to all the terms and conditions of this Lease other than the obligation to pay Base Rent for the First Additional Premises. Tenant may, at its option exercisable by written notice to Landlord, accelerate the First Expansion Date to a date earlier than _________ (but not earlier than the Commencement Date) as specified in such notice. Section 2.2 Common Rights. The Premises are leased subject to, and with the benefit of, the non-exclusive right to use in common with others at any time entitled thereto the Common Areas for all such purposes as such areas may be reasonably designated, but only in connection with lawful business in the Building. Landlord shall have the right from time to time to change the Common Areas. The above provisions of this Section 2.2 shall be operative only until the Second Expansion Delivery Date, after which there shall be no Common Areas. Section 2.3 Parking. Subject to the rights of Existing Other Tenant until the Second Expansion Delivery Date, Tenant Invitees are authorized to park passenger automobiles in the Parking Areas. Until the Second Expansion Delivery Date, Tenant shall not (a) permit any Tenant Invitees (other than visitors) to park in spaces designated as "visitor" spaces, (b) permit any Tenant Invitees to park in spaces designated as "reserved" spaces for Existing Other Tenant pursuant to Existing Other Tenant's lease, and (c) except for delivery trucks using designated loading and unloading facilities, permit any Tenant Invitee to park any vehicle on Landlord's Property other than passenger automobiles. Subject to (i) the rights of Existing Other Tenant until the Second Expansion Delivery Date, and (ii) Legal Requirements (including but not limited to Legal Requirements applicable to the Permitted Use), Tenant may restripe the Parking Areas and reconfigure the parking spaces within the Parking Areas and, to the extent necessary to use the Premises in compliance with Legal Requirements, and subject to compliance with Section 7.5 (without regard to Permitted Alterations as defined in Section 7.5), expand or construct additional Parking Areas, whether structured parking or otherwise, on Landlord's Property; provided, however, that if, under the terms of any mortgage on Landlord's Property, the consent of the mortgagee is required as a condition of expanding or constructing any additional Parking Areas, such expansion or construction shall be subject to such mortgagee's consent, but Landlord shall use commercially reasonable efforts to obtain such consent. With respect to any future mortgage on Landlord's Property, Landlord will negotiate in good faith to attempt to include a provision to the effect that the mortgagee will not unreasonably withhold its consent to the expansion or construction of additional Parking Areas. Section 2.4 Commencement Date; Lease Term; Rights to Extend. (a) The Lease Term shall commence at 12:01 A.M. on the Commencement Date and, unless Tenant timely and properly exercises its right to extend pursuant to Section 2.4(b), shall end at 11:59 P.M. on the last day of the Initial Term. (b) Provided there then exists no uncured Event of Default, Tenant shall have the right to extend the Lease Term for two (2) periods of ten (10) years each by giving Landlord written notice exercising such extension, which notice must be received by Landlord not more than eighteen (18) months nor less than twelve (12) months prior to the expiration date of the Initial Term or then current Extension Term, as applicable. If such notice is timely and properly given, the Lease Term shall be automatically extended upon the same terms and conditions except that (i) Base Rent for each Lease Year of an Extension Term shall be _________ percent (___%) of the Base Rent for the immediately preceding Lease Year, and (ii) there shall be no further right to extend or renew beyond the periods expressly set forth herein. (a) Simultaneously with the execution and delivery of this Lease, Tenant shall deliver to Landlord the Security Deposit, which shall be in the form of cash or a letter of credit which satisfies the conditions of Section 2.5(b) ("Letter of Credit"). (b) If the Security Deposit is in the form of a Letter of Credit, such Letter of Credit must satisfy all of the following conditions: (i) the Letter of Credit must be in the exact form attached hereto as Exhibit F or otherwise reasonably approved by Landlord with an expiration date not less than one (1) year after the date of the Letter of Credit; (ii) the beneficiary of the Letter of Credit must be Landlord or Landlord's designee; (iii) the Letter of Credit must be irrevocable, unconditional and transferable one or more times without charge; (iv) the Letter of Credit must by issued by Fleet National Bank or another ___________ bank satisfactory to Landlord in its sole and absolute discretion; and (v) the Letter of Credit must provide that it may be drawn at a location in _________, ___________. If, at any time, the issuer of the Letter of Credit gives notice of its election not to renew, extend and/or reissue the Letter of Credit, then Tenant shall, on or before forty-five (45) days prior to the expiration of the term of the Letter of Credit, deliver to Landlord (1) a replacement Letter of Credit satisfying all of the above conditions or (2) cash in the full amount of the expiring Letter of Credit; and if Tenant fails to timely deliver to Landlord a replacement Letter of Credit as provided above or cash in the full amount of the expiring Letter of Credit, such failure shall constitute a payment failure under Section 12.1(a) and, in addition to any other rights which Landlord might have by reason of such payment failure, Landlord may draw on the Letter of Credit and hold the proceeds of such drawing as the Security Deposit. If Landlord draws on the Letter of Credit and holds the proceeds of such drawing as the Security Deposit under the immediately preceding sentence, then, as long as there exists no uncured Event of Default, Tenant may provide a replacement Letter of Credit in the amount of the Security Deposit which satisfies the conditions of this Section 2.5(b), whereupon Landlord will release the cash Security Deposit to Tenant. If (x) Landlord shall reasonably determine that there has been a material adverse change in the creditworthiness of the bank issuing the Letter of Credit and Tenant shall fail, within ten (10) days after notice, to either provide a replacement Letter of Credit as provided above or cash in the full amount of the existing Letter of Credit, or (y) Tenant fails to provide Landlord with cash in the full amount of the Letter of Credit within ten (10) days after notice to Tenant that (I) any proceedings under the Bankruptcy Code, receivership or any insolvency law are instituted with the issuer of the Letter of Credit as debtor or (II) the bank issuing the Letter of Credit is taken over by the Federal Deposit Insurance Corporation, the Resolution Trust Corporation or a similar entity, then such failure by Tenant under clauses (x) or (y) of this sentence shall constitute an Event of Default and, in addition to any other rights which Landlord might have by reason of such Event of Default, Landlord may draw on the Letter of Credit and hold the proceeds of such drawing as part of the Security Deposit. (c) The Security Deposit is security for the faithful performance and observance by Tenant of the terms, provisions and conditions of this Lease and is not an advance payment of rent. It is agreed that if an Event of Default occurs, Landlord may use, apply or retain the whole or any part of the Security Deposit to the extent required for payment of any Base Rent, Additional Rent, or any other sum as to which Tenant is in default or for any sum which Landlord may expend or may be required to expend by reason of the occurrence of an Event of Default, including, but not limited to, any damage or deficiency accrued before or after summary proceedings or other re-entry by Landlord, including the costs of such proceeding or re-entry and further including, without limitation, reasonable attorneys' fees. It is agreed that Landlord shall always have the right to apply the Security Deposit, or any part thereof, as aforesaid, without additional notice and without prejudice to any other remedy or remedies which Landlord may have, or Landlord may pursue any other such remedy or remedies in lieu of applying the Security Deposit or any part thereof. No interest shall be payable on the Security Deposit and Landlord shall have the right to commingle the Security Deposit with other funds of Landlord. If Landlord shall apply the Security Deposit in whole or in part, Tenant shall immediately upon demand pay to Landlord the amount so applied to restore the Security Deposit to its original amount. Because (i) Tenant's Share of (A) Taxes, (B) Insurance Costs and (C) Operating Costs, (ii) Tenant's Electricity Costs and (iii) Other Additional Rent may be subject to annual reconciliation based on actual amounts determined to be due, in addition to the other rights provided herein to Landlord regarding the Security Deposit, Landlord shall have the right, in its discretion, upon the end of the Lease and delivery of the Premises in accordance with the terms hereof, to hold a reasonable portion of the Security Deposit (or whatever amount remains after Landlord exercises its other rights hereunder) until fifteen (15) days after such reconciliation, at which time Landlord has the right to deduct any amounts then determined to be due from the remaining Security Deposit and return any balance of the Security Deposit to Tenant. If the remaining Security Deposit, if any, is not sufficient to pay Tenant's obligations hereunder, Tenant shall pay the same within ten (10) days of billing from Landlord. In the event of a sale or other transfer of Landlord's Property, or leasing of the entire Landlord's Property including the Premises subject to Tenant's tenancy hereunder, Landlord shall transfer the Security Deposit then remaining to the vendee or lessee, in which event Landlord shall thereupon be released from all liability for the return of such Security Deposit to Tenant; and Tenant agrees to look solely to the new landlord for the return of the Security Deposit then remaining. Tenant further covenants that it will not assign or encumber or attempt to assign or encumber the Security Deposit and that neither Landlord nor its successors or assigns shall be bound by any such assignment, encumbrance, attempted assignment or attempted encumbrance. Section 2.6 Measurement. Either party may, by written notice given to the other during the period of ninety (90) days after the Commencement Date and/or during the period of ninety (90) days after the First Expansion Date, request an actual measurement of the Leasable Square Footage of the Premises, in which event Landlord's Architect shall make the requested measurement in accordance with BOMA standards and such measurement shall be used for purposes of this Lease until the Second Expansion Rent Commencement Date. If a measurement pursuant to this Section 2.6 results in an adjustment in the Leasable Square Footage of the Premises from that set forth in Item 3C of the Summary of Basic Terms, such adjustment shall be made retroactive to the Commencement Date (if the measurement is made within ninety (90) days after the Commencement Date) or the First Expansion Date (if the measurement is made within ninety (90) days after the First Expansion Date). If such adjustment is an increase in the Leasable Square Footage of the Premises, Tenant shall pay to Landlord the retroactive increase in Base Rent and Additional Rent within ten (10) Business Days after Landlord invoices Tenant therefor. 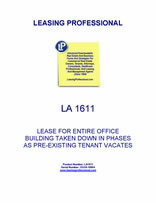 If such adjustment is a decrease in the Leasable Square Footage of the Premises, Tenant may credit the overpayment of Base Rent and Additional Rent resulting from the retroactive decrease in Base Rent and Additional Rent against the installments of Base Rent and Additional Rent next coming due. Section 2.7 Lease Amendment. If, pursuant to Sections 2.1, 2.6, 8.1 or 11.1 or any other provision of this Lease, there results a change in (or, in the case of the Second Expansion Delivery Date, the confirmation of) any of the terms or amounts in the Summary of Basic Terms (including, without limitation, the Leasable Square Footage of the Premises, Base Rent, or Tenant's Share) then in effect, Landlord and Tenant will promptly execute a written amendment to, and restatement of, the Summary of Basic Terms, substituting the changed (or confirmed) terms and recomputed amounts in lieu of each of the applicable terms and amounts then in effect which have been changed. As of the effective date of the amendment to the Summary of Basic Terms, the changed terms (and recomputed amounts) will be effective for all purposes of this Lease, and the amended and restated Summary of Basic Terms will be a part of, and incorporated into, this Lease.